Welcome to Crazy Sweet Tuesday, were we’re smack in the middle of Online BlogCon! An oh, my, heck it’s blowing my mind out of the water. This post barely got written, I want to spend all my time on Facebook! First off, let me tell you all how grateful I am that you come and read my blog and share your sugar. Seriously, this is the best job I’ve ever had and I can’t believe I get to do it. So, thanks. It’s pouring rain here today (hello, Winter, I’m afraid your friend Fall decided to skip out on us this year!) and all I want to do is eat all these comfort foods. 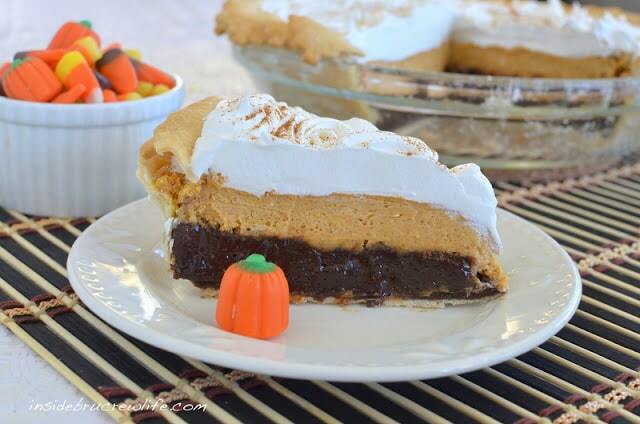 Pumpkin Cheesecake Brownie Pie by Inside BruCrew Life. I mean, it’s brownies in a pie. Genius! 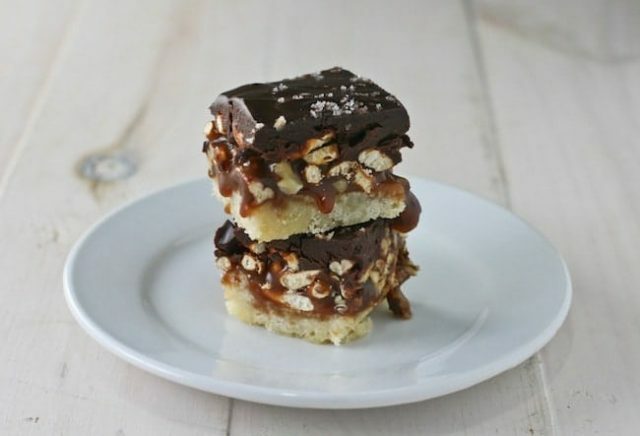 Salted Caramel Squares by Food Babbles. That shortbread and drippy caramel is making my mouth water. 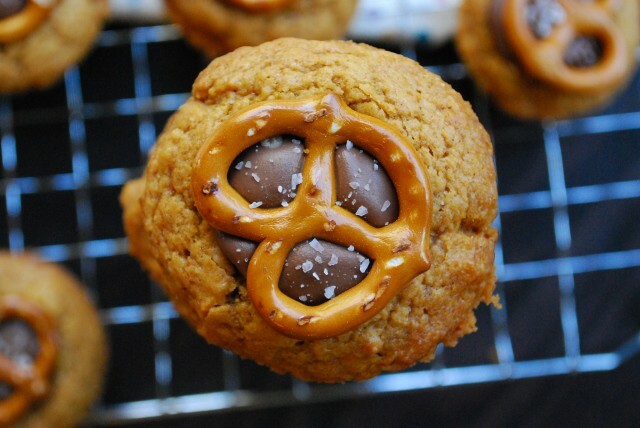 Rolo Pretzel Pumpkin Bites. I love creations like this – stuff you’d never think to pair works! Chocolate Mousse Pie by Chocolate, Chocolate, and More. Just yum! 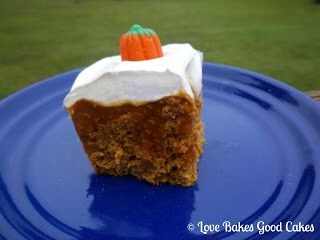 Pumpkin Spice Poke Cake by Love Bakes Good Cakes. I need to make a poke cake, methinks. 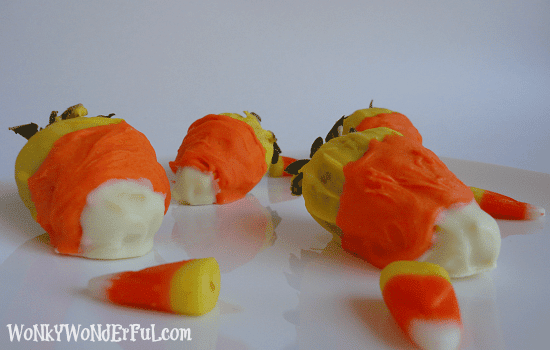 Candy Corn Berries by WonkyWonderful. How cute are these???? Peanut Butter Pumpkins by The Better Baker. 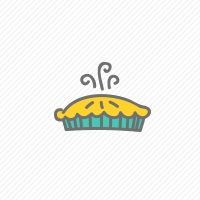 Cute and delicious! I need to make these! Thanks everyone for partying with me! It really means a lot to me. Okay, so…let’s start the party!